Developed for and licensed to BetterInvesting™ (formerly the National Association of Investors Corporation, NAIC), the BetterInvesting Portfolio Manager is recognized as one of the premier portfolio management software programs available to investors. Ideally suited for members of the BetterInvesting organization. Provides the hands-on investor with comprehensive portfolio management and investment record keeping tools. Not a member of BetterInvesting? 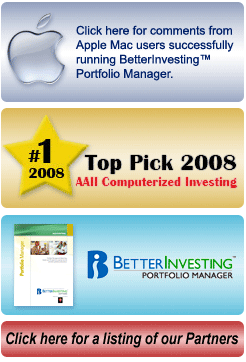 Then we suggest our other investment software program, the Investment Account Manager. Investment Account Manager 2.0 offers the tools you need to provide centralized portfolio management for stocks, bonds, mutual funds, exchange traded funds, options, cash and more.